. Love for the Supreme Being is higher than any religion. Mazhab was made by man, 'Mohabbat' by God.
. God's love is for all. But Irfan-e-Mohabbat, profound comprehension of love for the Almighty - is for the chosen few.
. Everything which one does with the thought of Almighty is a prayer. Not just sufi songs but even looking after your mother is `ibadat'. Similarly, providing water to the thirsty is worship.
. Within every person there is a mirror - "ek chashma hai, jo Khuda ke dhyan se jura hua hai." It may be misted over, but the way to make it clear again, she explains, is through "dard", pain, which is the "dehleez" or threshold that the Sufi seeker attempts to cross. Whoever wants to light the lamp can go to that threshold. You have to meditate, or at least think, on it.
. That Light, which "has nothing to do with religion circulates everywhere". Since it is everywhere, the only people who get agitated, overly-worried, are the ones with attachment to the world, not those who are tuned to the reality (of God). "Pareshaan wahi hai jo duniya se jura hua hai. Jo asliyat se jura hai, use takleef nahin." mazhab is different schools of interpretations in religion. 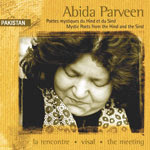 About // Abida Parveen was born in Larkana, Sindh, Pakistan, where her father, Ghulam Haider, ran a music school. Though women in Muslim society are rarely encouraged to pursue musical (or other performance) careers, her father recognized his daughter’s extraordinary talent at an early age and encouraged her to sing. Her career crystallized after her marriage to the late Ghulam Hussain Sheikh, a senior producer in Radio Pakistan who became her mentor.